Looking to start composting but don't know where to start? Our eight composting tips will have you creating your own plant food in no time. We’ve upgraded to reusable grocery bags, ditched bottled water and started shopping at our local farmers markets. So what’s the next frontier when you want to go green in the kitchen? Composting, of course! This natural method for recycling your kitchen scraps and lawn clippings is a great way to produce nutrient rich food for your garden. Plus, it keeps all those biodegradable scraps out of landfills. Helping the earth and your garden? Sounds like a win-win. But before you dive into composting at home, there are a few tips you need to know to be successful. Before you even start saving potato peels and apple cores, you need to think about your lifestyle. If you have a small household or a small yard, you might want to opt for smaller composting tumblers. If you have a large family, lots of land and plan to get serious about composting, you might want to consider building your own multi-stage compost pile. Ideally, you want a system with two parts: one for active compost (that you add to regularly) and one for, well, composting compost that’s further along and ready to use. Once you have your containers—be it a tumbler, a repurposed garbage can or a custom rig—you can really start getting into the nitty gritty of composting. Once you’re set up, you need to know exactly what sort of materials are compost-friendly. 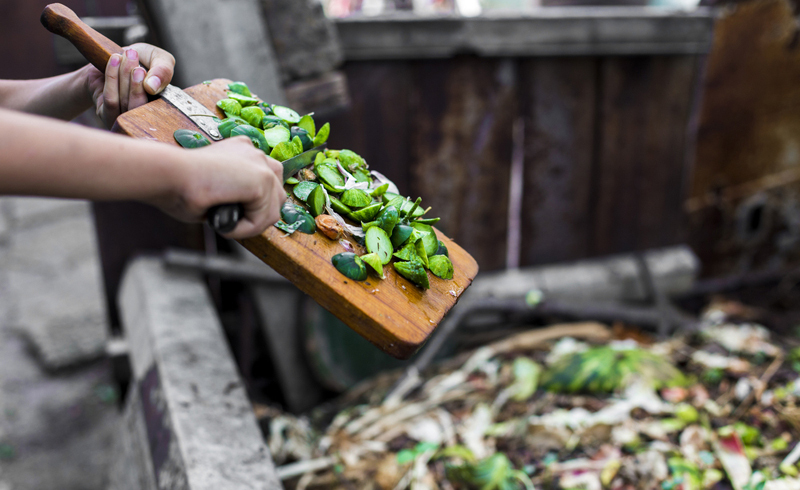 Produce scraps are absolute fair game when it comes to compost—peels, cores, stems and produce past its prime are all welcome in the compost party. Feel free to toss your coffee grounds and tea bags in the compost as well. You should also add dry leaves, grass clippings and other yard trimmings to balance your compost cocktail. When it comes to compost no-nos, be sure to keep all oils, fats, dairy, eggs, meats, fish and bones out of your compost bin. Also be sure not to toss any weeds into your bin. You don’t want those seeds (or weed killer) recirculating into your garden. One last thing: Fido’s droppings don’t make good compost, so skip tossing that into the pile. When it comes to compost, all those good ingredients will eventually break down to create some amazing plant food. However, if you want those odds and ends to turn into compost faster, you’ll want to break them down into smaller chunks—under four inches across is best. So if you have a few bad apples, just cut them into quarters before tossing them in. Left to sit still, your compost pile can start to resemble a trash heap (bad smells, not a lot of decomposition). To keep your compost working, be sure to keep it moving. If you’ve got a tumbler-style composter, just give it a whirl a few times a week. If you have a larger pile in your yard, use a pitch fork to give it a few good turns. More air flow in the compost means those ingredients are breaking down faster. When it comes to compost, you’re likely to get some visitors, however not all are bad news! Creepy crawlies like worms are signs of good compost (plus they help speed up the process). Pill bugs (or potato bugs) are also normal compost dwellers. If you find yourself with swarms of flies or boatloads of beetles, you might need to adjust your compost cocktail, according to Dave’s Garden. These creatures aren’t necessarily bad for compost, but they aren’t helping in any way—in fact, they can just be plain irritating. Consider adding more dry matter—old leaves or shredded newspaper—into your compost to make it less fly-friendly. On occasion larger creatures can find compost inviting, too. Raccoons, rats or even just a nosy dog can be an issue for compost. Try to opt for a closed system (like one of those fancy tumblers) or cage in your compost with chicken wire. These pests are normally attracted to meats, dairy and the like so be extra vigilant about keeping those ingredients out. While you may feel like a mad scientist adding odds and ends to your compost, the process isn’t as exact as most science experiments. You may find after a few weeks of composting that you need to add more wet or dry materials to keep your compost the right consistency—damp but not wet. Good wet ingredients include those coffee grounds, vegetable peels, past-its-prime fruit and the like. Shredded newspaper, dry leaves and even cardboard are good for drying your compost out a bit. To know when your compost is really working away and when it’s ready to use, you might want to invest in a compost thermometer. This tool—which looks like an exaggerated meat thermometer—reads the temp of your compost. Compost that’s actively decomposing can reach temperatures up to 160ºF at its core. Eventually, though, the pile will cool indicating that you’ve reached the right level of composition for using in your garden—this is typically around 68ºF or so. 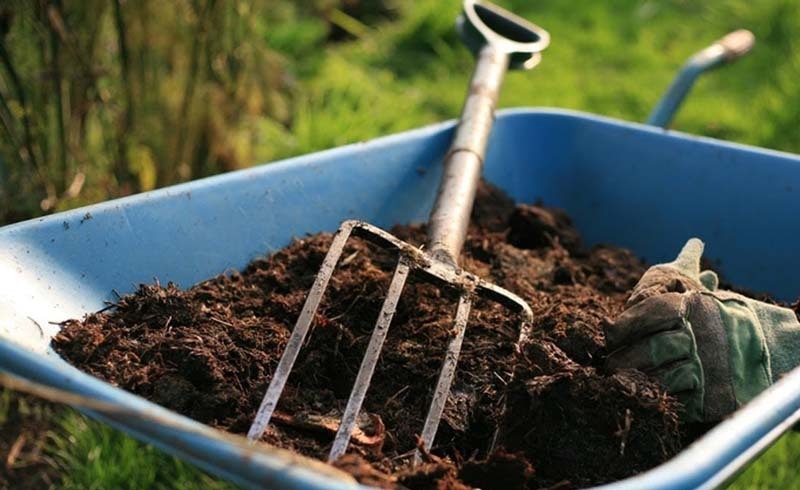 Once your compost reaches that lower temperature, feel free to add it to your garden. You can also just keep it on hand—there’s no rush to use it since it will keep and keep and keep. Compost is incredibly forgiving. Since you’re working with all organic matter, it will all break down eventually. Whether it takes you three months or an entire year, the results will be worth it.